I wanted to share a few personal feelings and insights about this past year. We arrived in New York one year ago today. We were full of excitement and some trepidation. I remember standing in the mission home kitchen with Sister Morgan (we only spent 2 hours with the Morgans before they left) I looked at her and pleadingly said "Will you please stay"? She laughed and said something like "you will be just fine. It's my time to go and your time to serve." I felt this heaviness that lasted until the next day when we walked into the chapel and saw the faces of our missionaries in person for the very first time. It was an amazing day...I often tell them it ranks very high as one of the best days of my life! There were many things I was not prepared for including the overwhelming love I would feel for each and every one of them individually. I could never have anticipated the pure joy this calling has brought or the anguish and sleepless nights when you know a missionary is struggling or there is some other worry in the mission. I have been blessed with countless opportunities to speak, teach, and testify. This has stretched me beyond anything I have ever done. It is also extremely rewarding to prepare and then feel the Spirit guiding me each step of the way. Little thoughts of direction or what to say come at a moments notice. There are so many blessings that come as we are anxiously engaged. Yet at the same time worry, discouragement, and wondering if we are making a difference are dark feelings that can be overwhelming at times. Dave and I constantly counsel together on what to teach, what to focus on, what do the missionaries need the most? How can we help them the best? It can be extremely overwhelming but then we have these sweet moments that confirm we are being directed and teaching what the Lord wants at this time. I have no doubt this is the Lord's work. It is absolutely remarkable to me. Watching these relatively young missionaries grow, stretch, transform into incredible teachers, humble servants as they endure rejection, hate, and persecution is the miracle of this work. Through their love and service they help people change their lives and come to know the Savior Jesus Christ in such a personal way. I still love to walk into a room of missionaries...it never gets old. They are filled with light and goodness. They are eager to succeed, they love so genuinely and give so freely of their time in the service of others because they love the Savior. I asked my kids, "What has been the best part of the first year of our mission?" "Getting to spend a lot of time with the missionaries"
"I love the new experience, getting to see how people live out here and the diversity between the different areas. I also love interacting with missionaries everyday and watching them grow throughout they're time on the mission. Whenever we have transfers we have the new missionaries sleep at our house the first night and we have a testimony meeting and then the next night we have the missionaries that are leaving sleep over and we also have a testimony meeting with them. 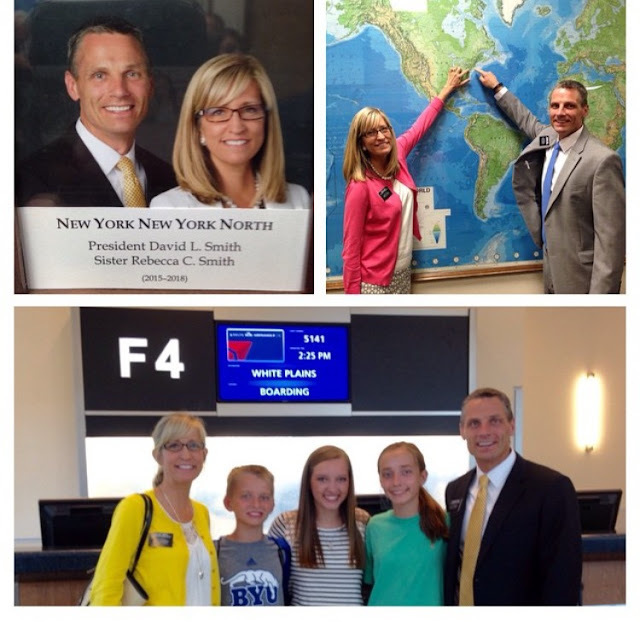 it's so cool to see how much the missionaries have changed throughout the two years/eighteen months and you can see that huge difference just in their testimonies." Thank you for the love and support you give them. Thank you for sharing them with us. We are connected through the eternities now. Thank you for your prayers on our behalf, we feel them and need them. So wonderful! Thanks for sharing. This past year, our serving under you in the NYNY North Mission has been one of the greatest blessings of our lives. We are so blessed by your service and are so grateful for the way you lead, guide and love our missionaries! Well said Sister Smith. Feeling very blessed that my son is the beneficiary of the Lord's love through your guidance, care, wisdom, and service.